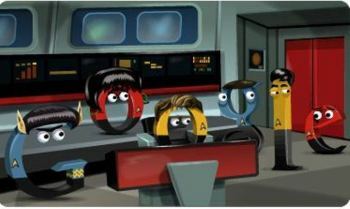 The 46th anniversary of the cult TV show Star Trek is Saturday but Google's celebrating the event early with a whimsical animated interactive "doodle" posted to its main search page Friday. The doodle has four "scenes." It starts on the bridge of the Starship Enterprise populated with the letters in the search giant's name dressed in the uniforms made famous in the series first aired on September 8, 1966, with the episode "The Man Trap." If you click the console, you'll hear some sound effects from the show. Sound effects, including the "swoosh" sound of sliding doors on the starship, are sprinkled throughout the doodle. Click the red "o," and you'll go to a closeup of it. Clicking the door at the right edge of the doodle takes you to the starship's transporter room. In the transporter room, clicking the vent at the left edge of the panel reveals a surprise from one of the series' most popular episodes. Clicking the "e" in the tableau prompts a tearful experience. (Note that "e" wears the infamous red uniform, which usually marks a crew member destined for elimination). Clicking the transporter console will beam the "e" and "o" (it has a haircut suspiciously similar to Captain James T. Kirk's) to the next scene, a barren landscape. 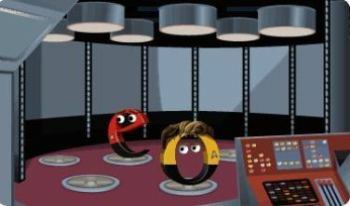 On the barren planet, the "o" and "e" are confronted with an aggressive alien. If you click the dead tree in the frame, "o" launches a slapstick attack on the alien. 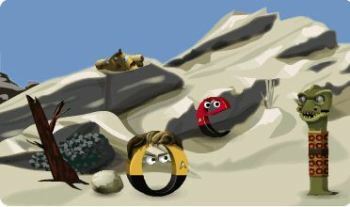 Click the weapon on the rock behind "e," and "o" will complete the scene in a grand fashion and return the doodle to the bridge of the Enterprise. The delightful doodle is the work of Ryan Germick, Google's chief doodler, and Doug Simpkinson, both fans of the show. Working on the doodle was a labor of love, the pair told the Hollywood Reporter. So far, their work has drawn kudos on Twitter from George Takei, who claimed the "l" spot. Nichelle Nichols later added her approval.